Romfea.gr has reported news from Metropolitan Benedict of Philadelphia that a three month old boy was healed by St. Nektarios in Jordan. The three month old boy was very sick with a collapsed lung and had entered into intensive care to be supported with oxygen. The parents were informed by doctors that there was no hope for their son. When the Metropolitan heard of this, he sent a priest named Fr. Nektarios to visit the boy, as well as all the sick of the hospital, every Saturday. To every sick person he would give the Holy Gospel, the life of St. Nektarios and oil from the vigil lamp of the Saint. The Metropolitan had asked that the boy with the collapsed lung be specifically anointed with the oil from St. Nektarios, and the miracle was almost immediate! He was completely healed that day and the next day returned home with his parents in perfect health. The boys parents, in gratitude to St. Nektarios, decided to name their child after his healer - St. Nektarios the Wonderworker. Later the Metropolitan himself visited the family and gave them his blessing. 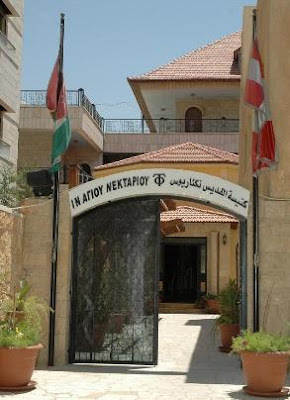 Metropolitan Benedict has made the name of St. Nektarios famous in Jordan with the church built dedicated to him. 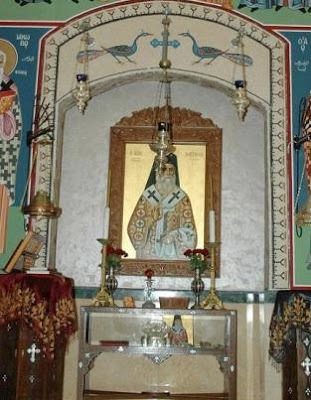 Another recorded seven miracles attributed to St. Nektarios have also been performed in Jordan.